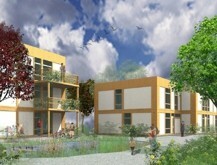 Researchers and co-operators have developed a novel way to make housing more affordable in the United Kingdom. The Mutual Home Ownership Society (MHOS) combines the advantages of three strategies. A community land trust owns the land and leases it to a tenant ownership co-operative. With assistance from the land trust, the co-op then negotiates with a lender for a mortgage. Alternatively, mutual housing investment bonds could be sold to finance the building, after the example of the Garden City of Letchworth a century ago. Once construction is complete, the co-op issues renewable leases to the member-tenants. One of their responsibilities is a lease payment calculated at 35% of monthly household income, after taxes and deductions. These payments and a 5-10% deposit also earn them equity shares in the co-op. Households that make higher lease payments earn more shares. As the co-op’s debt declines (and if the average earnings of members rise over time), the value of the shares goes up. Outgoing members leave with the growth in value of the shares they financed (minus an agreed percentage). Incoming members purchase occupancy rights and shares from outgoing members. A re-sale formula in the lease ensures the long-term affordability of each unit. MHOS is welcome news to municipalities where housing is growing unaffordable to large numbers of residents, including many public sector employees. If MHOS developers can acquire land at below-market costs, they can go on to offer a very secure investment to lenders or to social investors. They can improve the property over the long-term and attract member-tenants with both low-cost housing and the prospect of building equity – without endangering the affordability of the units. LILAC, England’s first MHOS (right), is currently under construction in Leeds. This article helps for the basis for the examination of alternative tenure and housing found in The Resilience Imperative: Co-operative Transitions to a Steady-State Economy, by Michael Lewis and Pat Conaty (New Society Publishers, 2012). This article is part of the i4 special series, Housing We Can Afford. It is produced in partnership with the BC-Alberta Social Economy Research Alliance (BALTA) , with the Canadian Social Economy Research Partnerships, and with funding from the Social Sciences and Humanities Research Council of Canada (SSHRC).